The Kiev authorities are doing everything to split Ukraine, implementing the West’s scenario for separating Ukraine from Russia, while ignoring the interests of their own people. In the end, the country was effectively split… The continuation of such a policy by the Kiev authorities may contribute to Ukraine’s loss of statehood. – Security Council Secretary Nikolai Patrushev, Rossiyskaya Gazeta, January 18 2019. These are bone-chilling words. In the mind of Russia’s Patrushev, the nation of Ukraine is an extension of Russia and it only exists at the pleasure of the Kremlin. This is a perspective that is not uncommon among many leaders in Russia and across many other former Soviet states. Though this seems to be an extreme perspective, this viewpoint does have some grounding in the historical reality behind these two nations. I have had the privilege of visiting Kiev at least a dozen times over the last twenty years as I have worked with clients and churches in Ukraine. Coming from the West, one arrives at Borispol International airport which is situated to the east of the city along the broad flatlands that stretch across Eurasia. As your car approaches central Kiev you run into the broad and marshy Dnieper river and you see a remarkable site across the water among the steep hills of the eastern bank. They call her the “Motherland Monument” (Родина-мать). Built in 1981, she towers at 102 meters and feels similar to her slightly shorter sister that sits in the harbor of New York City. 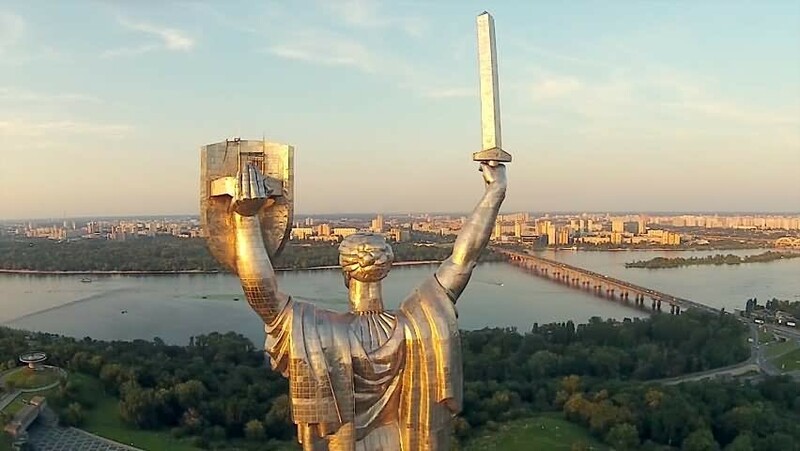 But, instead of holding aloft the “torch of Freedom”, the Motherland statue raises a sword: a physical act of defiance celebrating the victory over the invading Fascists during The Great Patriotic War- a.k.a., World War Two. Despite the fact that it is a war memorial, it is the “Motherland statue”, because it is here in Kiev where the history of the Russian people really begins. Now I want to be really careful on this point. I want to stress that this the birthplace of the “Russian peoples” in the broadest sense in terms of language and culture. The Russian nation was really born in the dense forests far to the north of Kiev. Nevertheless, the Russian people can all trace their shared history to this old city. More than one thousand years ago, many East Slavic tribes had gathered here along the bank of the Dnieper river- south of the marshes that lie in modern Belarus and north of the unnavigable rapids of the lower Dnieper before it reaches the Black Sea. However, they remained unorganized until Oleg, the son of a certain Viking named Rurik, organized the clans and offered them protection from the surrounding people groups. These gathered clans coalesced into the Medieval nation that we call “The Kievan Rus”- taking on the name Rus from the Rurik himself. Yes, the organizer and first ruler of Russian people was not a Slav but was a Scandinavian. One could argue that the heart and soul of the Russian people is as much Viking as it is Slavic. The consummation of the process of forming this Medieval nation happened in 987 when Vladimir, the great-great-grandson of Rurik, decided that his nation would become a Christian nation under the authority of the church in Constantinople. The process had started with the marriage of Vladimir’s grandfather to a Byzantine princess and set the (Kievan) Rus people along a cultural and spiritual trajectory that matched Byzantium. This lasted for a few centuries until the arrival of those formidable invaders from the East – the Mongols. The 13th century was a nightmare for Eastern Europe as the descendants of Genghis Khan rushed across the steppe sacking and burning nearly every city in their path. The city of Kiev was burned in 1240 and the nation of the Kievan Rus was no more. The Russian peoples were scattered among various city-states that lay mostly in the dense woodlands of the north. These territories went on the become vassal states of what we call “The Golden Horde”- a khanate that inherited the Western lands of the Mongol conquest of the 13th century. These khans ruled over the remains of the Russian people for centuries until Vasilly III, one of the princes of the vassal state of Muscovy, forced a retreat of the Khan’s army at the Ugra River in 1480. But the true ascendency of this former vassal starts with the bold and “terrible” actions of his grandson.